Royal Doulton, "Brambly Hedge" Collectors Plates, Set of four (4) Plates Depicting the four (4) Seasons, Made from 1985 thru 2006, Original Boxes, Original Hangars. 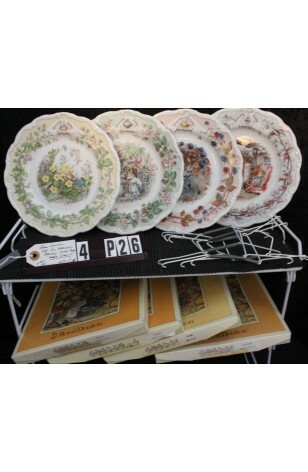 This complete Collection of Four (4) Seasonal Plates, is of the "Brambly Hedge" Series of Mice Living in the English Countryside, with each Plate showing a different surrounding. Lips of the Plates are different colors, with Flowers and Vine. Rims are Scalloped. Each Plate has Documentation on the back side. These would make a lovely Gift for a Child, or any Royal Doulton Collector. In Very Good Resale Condition unless noted below or viewed in pictures.